The Ascension of Christ. Late 6th century illuminated manuscript (c. 586). Public Domain. Note the faces of Christ and Mary (front and center) looking directly at us. See the texts (NRSV), artwork and Revised Common Lectionary Prayers at the Vanderbilt Divinity Library. The story of the final teaching and ascension of Jesus from Acts. "Wait until the power of the Spirit comes upon you ... then be my witnesses in all the world." An enthronement psalm for YHWH, and a fitting response for this day. "The Lord has gone up" (ascended) here means that YHWH (and for us, Jesus), is Ruler over all the earth. Use Tone 3 in G Major. A theological interpretation of the ascension of Jesus — "that you may know … what is the immeasurable power of his greatness for us who believe." An earlier Lukan version of the last words and ascension of Jesus. "Proclaim repentance and forgiveness of sins to all nations beginning in Jerusalem." Today is Ascension Day or Sunday. 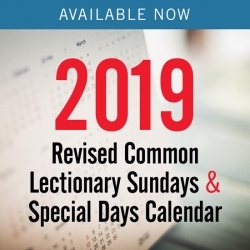 When John Wesley edited the English Book of Common Prayer for use by Methodists, he generally deleted most holy days that did not fall on Sundays. Ascension Day is one of only three he did not delete. (The others are Good Friday and Christmas Day). 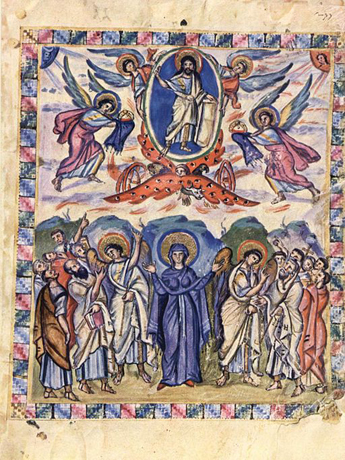 The texts for Ascension Day provide several lenses for proclaiming and living with the reality of the ascension of Jesus. It is clear in all of today’s readings that the act of Ascension (Jesus rising into the sky) is less important than what it signifies — his enthronement, his being exalted to the right hand of the Father, and the fullness of his authority in heaven and on earth. Like the Resurrection, the Ascension is not a set of historical propositions we investigate to prove or disprove, but rather is foundational to God's history with us and our history as God's people in Jesus. It is affirmed in all the ecumenical creeds, not as an interesting side note but on a par with the incarnation, crucifixion, and resurrection. "He ascended into heaven" does not refer primarily to a journey from this planet to some other realm in the sky, but to the reality of the fullness of Christ's reign now and in eternity. See UMBOW 401-404 for additional Ascension-related resources. Luke provides the fullest "orderly account" of the events surrounding the ascension of the resurrected Jesus into heaven. And he does so in his typically subversive way. On the one hand, his ascension is a radical affirmation of the heaven-endorsed kingship of Jesus. On the other hand, Jesus refused to answer the disciples' question about kingship (verse 6). The Risen One, about to be ascended, tells them that's entirely the wrong question. Instead, he says, "You will receive the power of the Holy Spirit coming upon you, and you will be my witnesses in Jerusalem, and in all Judea and Samaria, and to the ends of the world." Their focus is not to be on Israel's kingdom, but on being witness of Jesus, everywhere the Spirit would send them, all over the world. It's at that moment that the ascension happens. The lives of disciples, witnesses to and followers of Jesus, are to be a response to the power of the Spirit moving in and through them and driving them in witness to the world. It is the Spirit, sent by the Father and prayed for by the Son, who calls, guides, empowers and directs us. We are not to rely on the "props" or "laurels" of any earthly kingdom. Who do you and your worship planning team know who has clearly experienced the power of the Holy Spirit coming upon her or him in a way that ratifies the reality of the ascension/kingship of Jesus? Talk with several of these people, and ask them to describe both what that power is like in their lives and how the experience of that power helps them to see or understand what it means that Jesus Christ is ascended into heaven, Lord of all. The stories and images you draw from these conversations will be living illustrations of the reality of the ascension of Jesus in your midst. Paul prays for the congregations in Ephesus and environs. He longs for them to know three things deeply: the hope to which Christ has called them, the abundance of Christ's inheritance revealed in God's people everywhere, and the immeasurable greatness of Christ’s power. That’s a truly bold prayer. Paul goes on to indicate he can pray this way precisely because Christ is ascended into heaven, “far above all rule and authority and power and dominion,” seated at the right hand of God. Paul was not being glib or merely eloquent in his requests, either. The letter he writes to these churches is partly a response to that prayer, and partly an extension of it. Because they are in Christ, and Christ is ascended into heaven at God’s right hand, the hope they have is beyond our understanding, the inheritance they receive is abundant, the greatness of Christ’s power in them can indeed be immeasurable. 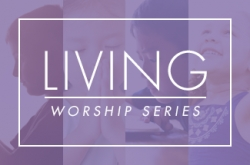 Here’s an opportunity for your worship planning team to have some rich conversation around these three phrases, coming to grips with what each already means or might mean for your worshiping community as you prepare for this time of worship. 1. What is the hope to which Christ has called you? Note—the word here is hope, not doctrine. In other words, this is not a “what” or an “event” but a living, breathing expectation here and now. How well do people know such hope where you are? How do those who know it express it? 2. How can you help open the congregation's eyes and ears and other senses to the abundance of Christ's inheritance in the people already around them? 3. What signs can you see together (or help your congregation see anew) of the "immeasurable greatness" of Christ's power where you are? The version of the Ascension story in the gospel focuses on the scriptural content of the message to be proclaimed after Christ ascends: the ministry, suffering, death and resurrection of Jesus as the basis for repentance and forgiveness of sins. A call to repentance may be hard for some of us to hear or offer. We hear those words, and we may immediately come up with negative stereotypes — arrogant missionaries, manipulative evangelists, judgmental, finger-pointing fundamentalists. When the “seeker church” movement was fashionable, many of its advocates encouraged deleting any sort of confession of sin from worship on the grounds that it may offend or confuse newcomers or make them feel bad about themselves. Get over it! Help your people get over it! Guide them into solid ways of faithfully embodying this call of our risen, ascended Lord. Acknowledging our continuing battle with sin and the places where we’ve either fallen or not yet prevailed is essential to our prayer life and to living as disciples of Jesus and missionaries in Christ’s name. We are not “okay,” but in Christ we can be forgiven. We are still broken in many ways, always in need of repentance, but we can continually move on to perfection in love in this life. The good news here is that such repentance is made possible for us through our risen and ascended Lord who offers forgiveness so we can change, mend and move on. How do repentance and forgiveness of sins in Christ’s name bring hope and power to the lives of people where you are? Through your dearly loved Son, Jesus Christ, Lord of All. Who follow his way that leads to life." "And so, with your people on earth …"
The church where I regularly attend worship has been going through a crisis in recent weeks. Toward the start of this crisis, a guest vocal group came to sing in morning worship. Between songs, one of the members of the group took a moment to offer his testimony and to acknowledge and comment upon the crisis the church was going through. He said, in essence, that while he didn’t know the reason that God had for bringing the crisis to the church, he was sure that God had a purpose in it. He said that what the church was going through was God’s plan. While I know the comment was well-intended and from the heart, as a United Methodist and a non-predestinarian, I would respectfully disagree with this man’s assessment of the situation. I do not believe that God purposefully sent this crisis and the real human suffering that is involved in it for some divine purpose that we can’t see. Nor do I believe it is some part of God’s plan for the church. I believe that God has given us free will, and that God allows for evil and much suffering in the world. But through the power of the Holy Spirit, God is with us in our times of joy and in our times of suffering alike. It is our call to witness to God’s love and grace to the ends of the earth, not to try to come up with some kind of theological explanation for why an individual or a group or a nation must suffer. Why do I bring this up on Ascension Sunday? Because I was reminded of this experience when I began to think about how this particular story speaks to a period of crisis and transition among the earliest followers of Jesus Christ. The first chapter of Acts begins with a summary of what has happened since the end of “the first book” (verse 1), Luke’s gospel, and the present moment. It has been forty days since the empty tomb was discovered on the first Easter morning. During those forty days, Jesus has “presented himself alive to them by many convincing proofs, appearing to them during forty days and speaking about the kingdom of God” (verse 3). Jesus then ordered the disciples to wait in Jerusalem “for the promise of the Father” (verse 4). So the disciples had asked him if this, in fact, was the time when Israel would be restored to her former glory. And Jesus said, “It is not for you to know the times or periods that the Father has set by his own authority” (verse 7). After that, Jesus said the power of the Holy Spirit would come to them in Jerusalem and that they would be his witnesses to the ends of the earth. He was then lifted up into a cloud, and he disappeared. I was reminded of this experience at my church as I read this first chapter in Acts because I don’t think that dealing with a crisis is as much about God’s plan or purpose as it is about the inevitability of cycles of loss and renewal, grief followed by hope for tomorrow, life and death, death and new life. That is the pattern of human life that God seems to have set into motion for us. In this story we find a perfect example: The disciples watched as Jesus suffered and died. Then, they searched for new understanding and caught a glimmer of what was to come over the forty days when the resurrected Lord kept appearing. Next, they watched in awe and confusion as their Lord ascended into the clouds and disappeared. And then they waited. They waited as he didn’t reappear this time around. They waited for what was to come next. As they waited, they must have wondered why this was happening to them. They must have come up with possible explanations. And they must have been dealing with the inevitable mixture of emotions that comes with periods of transition: grief over their loss, confusion and fear about what would come next, hope that came from hearing Jesus’ words and promises. Periods of transition are always difficult for human beings. We want answers, but sometimes there just aren’t any. Sometimes we just have to be still and wait. In many of our churches, this time of year is marked by grief and loss, transition and hope, excitement and anticipation for what is yet to come. Like the disciples, we sit somewhere between the mourning and the dancing. It is a time of year when folks are saying goodbye to one pastor and preparing to welcome a new pastor. It is a time when we as pastors have to sit in the middle of saying goodbye to people we have loved, perhaps have struggled with, and the uncertainty of what the next community we are appointed to serve will bring. Whether we are facing a pastoral change or something else, transitions are part of the lives of everyone we serve. How can the disciples’ example and Jesus’ promise to them speak a word of hope to those in our own congregations who are going through a difficult time, be it a crisis or a shift in pastoral leadership or simply one of the normal transitions of life that we all must face? How can the Holy Spirit sustain us through difficult times? And how can we look forward with hope and joy to the new life that is surely to come during periods of uncertainty and waiting? I love Paul’s prayer for the church in Ephesus. I especially love verses 17'19: “I pray that the God of our Lord Jesus Christ, the Father of glory, may give you a spirit of wisdom and revelation as you come to know him, so that with the eyes of your heart enlightened, you may know what is the hope to which he has called you, what are the riches of his glorious inheritance among the saints, and what is the immeasurable greatness of his power for us who believe, according to the working of his great power” (NRSV). There is a sense in Paul’s letter that even though he knows the good people of Ephesus to be people of strong faith in the Lord Jesus (verse 15), there is still more for them to know about him. Paul implies that knowing Jesus is not something that happens in a singular moment, but rather it is something that comes over time -- over the course of a lifetime. Throughout our lives, the power of the Holy Spirit continually fills us with new wisdom and enables us to see and experience Christ's presence in new and different ways. What new wisdom and revelation have you experienced over this season of Eastertide? What new wisdom and revelation have the people you serve experienced? Where have the people in your community seen the real, active presence of Christ at work in your midst? How have the eyes of your hearts been enlightened? According to Luke, who was an eyewitness to these events, everything that is recorded in Luke and in Acts is exactly what happened as he recalled it. He saw the risen Lord with his own eyes. He touched him with his own hands. He smelled the fish that the risen Lord ate before him. He listened to Jesus' words with his own ears, and he watched personally as Jesus ascended into the heavens. He waited in Jerusalem with the other disciples, and he felt the Holy Spirit come like the rush of a mighty wind, and he saw the tongues of fire and heard all the different languages being spoken all at once. His is an eyewitness account of the life, death, and resurrection of Jesus Christ. And Luke says that Jesus told the disciples that they were to go out into the nations and share this witness with others, so that is exactly what he did. He went and he told the stories, and he even wrote them all down, so that now we can read them even today, over 2000 years later. According to the instructions given by Jesus, the role of the disciples was to give witness. That is, they were to share with other people what they had seen, heard, touched, smelled, tasted, and experienced for themselves about Jesus. According to the legal definition, a witness is someone who has firsthand knowledge about a crime or dramatic event through their senses (e.g. seeing, hearing, smelling, touching) and can help certify important considerations to the crime or event. A witness who has seen the event firsthand is known as an eye-witness. Witnesses are often called before a court of law to testify in trials. If a person is called to give a witness in a court of law, that person can speak only about what he or she has personally experienced. The person can't talk about what someone else has told him or her, or tell what someone else said he saw. That is hearsay, and hearsay doesn't hold up in a court of law. Why? Because as evidence, it just isn't reliable. Nor is hearsay as powerful as a direct witness account of something. What is true about the court system is also true about religious experience. If we are to be effective witnesses, we need to tell what we have personally experienced. That means that we need to be telling our own stories as preachers, and we need to be inviting the people in our congregations to tell their stories. You as a preacher can tell a story you read on a sermon illustrations website or in a book, or you can share what someone told you about an experience of Christ in their life. But retelling someone else's story would not be nearly as convincing or powerful as it would be to hear a person from the congregation tell his or her own story. Perhaps this Sunday offers an opportunity, if you haven't done this already during the Eastertide season, to invite someone from your congregation to give his or her witness to experiencing Christ in his or her life. Or perhaps at some point in the sermon, invite the congregation members to share a story with the person sitting next to them. On this day of all days, be sure to stress that by the power of the Holy Spirit received from on high, every follower of Jesus Christ is now a witness of these things, and as a witness is called to proclaim them to all the nations.